As a way to end the summer session, Samin and I combined our classes together to discuss the friendships we’ve made at TYO. We began by playing a video story of the popular and beloved book, The Giving Tree, by Shel Silverstein. As the video played, we stopped periodically for translation from our translators Yazid and Refiq. Samin and I were amazed at how much the children enjoyed the story! Afterward, we led a discussion about the story and its meaning. One student said, “the boy kept using the tree until it was naked”. Another said that a friendship shouldn’t be like that. Instead, it should be about equal giving and taking from both sides. Samin and I were so impressed by how engaged the children were throughout the story and what conclusions they were able to draw from it. We asked if anyone had made a new friend this session and they all raised their hands “Ah! Ah!”. They had made friends from other neighborhoods and refugee camps. To remember the new friends we made, all of our students made friendship bracelets to exchange with one another. And the next day at the pool, we spotted all of our students still wearing their friendship bracelets, showing us with pride. As our last days are coming to an end, I had a chance to think about all of the friends I have made during my time here as an intern. Women like Jenan, Lina, Hanin, and Raja, students like Layal, Safa, Qais, and Maha, and volunteers like Doha, Zaki, and Yazid and Tamam. I’ve also made friends at Hajjawi, Cinema City, and the juice shop, some of our favorite places in Nablus. The greatest gift I received during my time here is the opportunity to call these Palestinians my friends. Tala is a summer intern at TYO Nablus. My volunteers are my extra set of eyes, ears and hands. They step in when I need materials passed out and when I need help rearranging my classroom for a new activity. They step in when a child needs a hole punched for a mask and when they need a string tied for a kite. Most importantly, they step in when a student has a problem that I can’t immediately address. After all, I am just one person with anywhere from 10-18 students. And without my volunteers, I couldn’t teach my classes. This past Monday, right after Field Day in Balata and Community English class, my volunteers, translator and I met in my classroom to discuss our Arts & Crafts class. Throughout the session I have continuously stressed that this class is ours and I always welcome and encourage suggestions. But on Monday, I wanted to remind them just how important they really are to this class. For the next 45 minutes we discussed what we’ve learned about our class and our kids thus far. What works in class and what doesn’t, what needs to stay and what should we change, but also how to improve. The amount of feedback I got from them was amazing. Together we agreed, using the hand clapping technique we tried to implement at the start of the session, doesn’t get the children’s attention like we had hoped. But making simple yet functional projects is a great way to keep the kids engaged. I appreciated the craft project suggestions from them too. Everything from flowers made of plastic bags, to face paint, to a mural! I have already implemented an idea: adding background music to class while they work on their project. The kids really enjoyed it too! I want my volunteers to be on board for every craft project or silly game I attempt with my kids. I want them to be as enthusiastic about lessons as I am. And so that things runs smoothly, it is so important that they are included in the decision-making process and can take some ownership of the class. I know that my volunteers walked away from the meeting on Monday feeling much better about the remainder of the session. Weekly, I will keep reminding them that this class is our class. At the end of June, the staff, interns, volunteers, and kids of TYO held what we’ve lovingly referred to as “Water Day.” The kids played about thirty minutes of soccer before volunteers began to emerge from the shadows of the Center, carrying mysterious baskets, bags, and buckets overflowing with the water balloons we’d spent hours preparing. I could practically hear the “Rocky” theme song as I watched, preparing for an epic afternoon. Nothing breaths life into a childhood memory quite like a water balloon or two. Intern Cate and I got our kids settled in a large circle for a game of “Drip, Drip, Drop” – like Duck, Duck, Goose only instead of yelling “Goose!” the kid dumps a full cup of water on his/her target’s head (also, we decided to throw water balloons in lieu of tagging.) Cate and I jovially agreed to play, and mere moments after settling onto the concrete I had a water cascading down my forehead as I sputtered a laugh and tried to maintain control of my cotton-candy pink balloon. The kids had a blast, and we learned a few interesting tidbits as well. Little Izz, for example, is only slightly slower than the speed of sound. The kids, who we worried might stick with their friends, turned out to be equal-opportunity soakers. Kids soaked teachers, teachers soaked volunteers, water balloons both missed and connected with their targets as everybody tried to figure out the best way to launch a balloon with a mixture of velocity and precision. It was a ton of fun. Toward the end of the day, as we started to settle the kids and get them ready for the bus, I leaned down to pick up a small balloon that hadn’t popped. Before I could get back up, a tidal wave connected, Rose Bowl style, with the back of my neck. I turned to see our adorable Lin frozen in place with a now-empty bucket, grinning. As I stared at her in mock shock and teasing anger, I was hit with that profound realization that you’re in the middle of a memory that will last for years beyond its expiration. So although I was still picking water balloon pieces out of my hair hours later, Water Day was a hit. My favorite moments here at TYO are those that transcend age and culture – the moments that emphasize our commonalities rather than our differences. And everyone, as it turns out, enjoys a good water balloon fight. Amy is a summer intern at TYO Nablus. On the morning of Tuesday, July 5th, the high-pitched voices of 50 third graders could be heard humming “This land is your land, this land is my land, from California, to the New York Islands…” Had Boy Scouts invaded the TYO Center? Had a Midwest homeroom class been transported to the TYO Center? Neither! A Palestinian classroom had magically transformed into a celebration, all with the help of some games, a little paint, and delicious burgers. Many smiles ensued. Normally, on Tuesday and Thursday mornings, the interns pile into Munir’s car for the windy trek over to Salfit, a nearby Palestinian village, for some extracurricular English classes at their local American Corners library. American Corners is a worldwide program run through the U.S. State Department. In Palestine, its sites aim to share American history and culture while also encouraging intercultural dialogue through literacy. So in that spirit, we celebrated the 4th of July with our Salfit students. Armed with flag coloring sheets, patriotic paint colors, and Independence-themed Bingo, we led various lessons on the most important values we share with our Palestinian brethren. Concepts like “family,” “nation,” and “pride” are ideas that translate well in any language, and our students were excited to share with us their own holidays, traditions, and pride in their country. Through this special celebration, TYO hopefully imparted some of the best values we all honor on Independence Day. And, of course, what would the 4th of July be without hot dogs, hamburgers and ice cream? Happy (belated) Independence Day from all of us at TYO! Over the course of the next week, TYO will post to this blog many of the SOW National Team’s reflections. 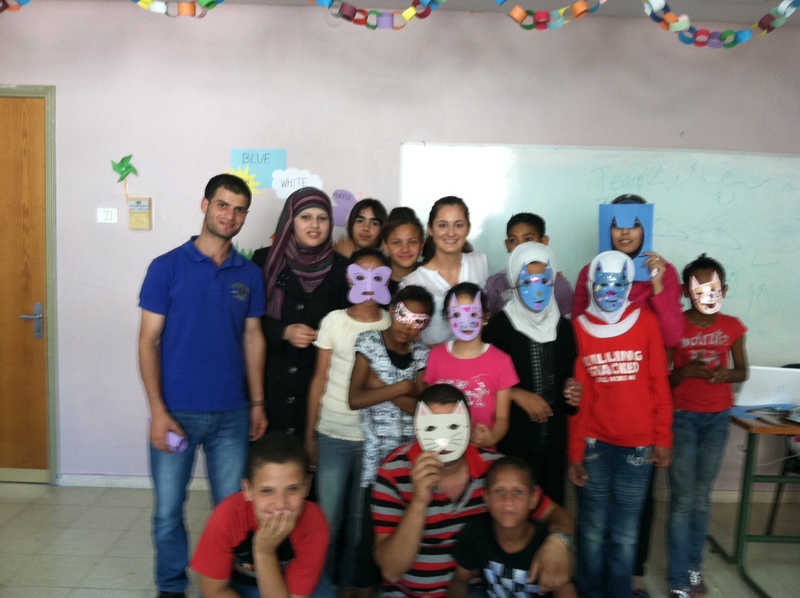 It was an absolute pleasure hosting them in Nablus the last four weeks. We will miss dearly their passion, energy and commitment to their work. Thank you for sharing your talents with us.